Do you know the 90/10 theory? Apparently there are a few different versions of it. Steven Covey has the most famous explanation. "10% of life is made up of what happens to you and 90% of life is decided by how you react.” I believe he’s on to something. This means we only have control over 10% of what happens to us. The other 90% - our actions, our reactions, our interpretations, our MISinterpretations - we‘re in charge of that. That’s good news! When we react to something, how we react then affects the very next thing that will happen, and will affect the life of the very next person we encounter, like a pattern of dominoes. It's a fact of life, eventually the dominoes are going to go tumbling. We may not be able to control when they fall, but we can control whether they go tumbling in a negative direction, or a positive one. There’s also The Butterfly Effect or Chaos Theory. This theory grants the power of a tiny butterfly flapping its wings in New Mexico to cause a hurricane in China. It may take a very long time, but the connection is real. If the butterfly had not flapped its wings at just the right point in space/time, the hurricane would not have happened. Small changes in initial conditions (10%) lead to drastic changes in the results (90%). Our lives are an ongoing demonstration of this principle. Who knows what long-term effects our actions and reactions can cause on a global scale! Of course we go through life with the best of intentions, but we’re all human. We’re not robot unicorns of happy reactions and all good choices. We’re human, and because we're human challenging situations get the best of us all the time. I know oftentimes I’ll find myself in a notsogreat situation and I give it much more value than it is truly worth. But if I stop and think about it, I can assert that the situation only gets 10% of my attention. That’s nothing compared to my other 90% of my time and my energy, right? 90% is hard work, 10% is luck. I was in yoga class last week and the teacher, Cooper Chou, challenged this thinking. He gave his 90/10 theory. He says our intention should be 100%. But our effort should only be 90%. What?! What happened to the other 10%? Cooper explained that so often we go at something full force and we never make it to the end. We gas out and deplete our stores that are desperately needed to complete many tasks. He applied it to each of the poses we were doing and then kept bringing it back to our efforts in real life. He said that going at something with 90/10 leaves room for a little boost, a pep talk, a final burst of energy to get us to the finish line. In yoga poses, he suggested that we approach a pose with 90% effort and then just breathe into it for the remaining 10%. It was such a sweet way to go deeper into a posture without struggling. And in life - have a goal with 100% intention, give it 90% effort and then just breathe. He said oftentimes we’ll find ourselves just coasting on that much needed breath and get even farther than we intended. I disagree, I think it especially applies to them! We all only have 100% to give. Period. The end. Now my 100% looks and feels incredibly different than what gold medalist Shaun White’s does. His 100% looks like 225% because it is fueled and fortified with training, genes, expertise, and competition. I would bet athletes like Shaun employ the apply 90, reserve 10 theory and that’s what makes them winners. Pace, timing, breath, final pushes… and their stakes are higher and dipped in GOLD, there’s an every four year timeline put to their efforts. But they still only have 100% to give to every situation. So do I! So do you! I find that so encouraging and inspiring! We all are potential gold medalists in everything we do. In the spirit of the Olympics and all of this talk of intention and effort, I’m sharing a recipe for a special sweet treat. I have some friends that don't eat eggs and some that don't eat gluten. No one should be denied a sweet treat, right? I think eggs and flour in combination with sugar and butter add up to some incredible desserts. That combination isn't for everyone though. I want ALL of my friends to enjoy this one. 100%! ** melt 1/2 teaspoon butter in a small skillet, add 1/4 cup quinoa that has been prepared according to package directions. Stir and cook over medium heat for 3-5 minutes until the quinoa crisps and pops a bit. To the food processor, add the dates. Pulse until they are broken apart and sticky, about 30 seconds. Add nuts and pulse until ground and evenly distributed in the dates. 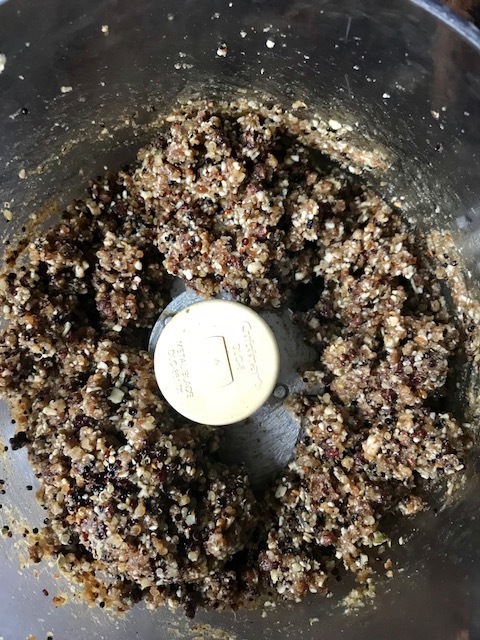 With the food processor running, add the remaining ingredients (minus the quinoa and chocolate bar) and process until a dough begins to form. You should be able to pinch it between your fingers and it will stay together. Pulse in the toasted quinoa. Form the dough into 1" ball-sized truffles. Place the ball on a parchment lined baking sheet and set aside. Melt the chocolate bar over a double boiler or in the microwave. With a fork, dip each ball into the melted chocolate gently swirling to coat and return them to the baking sheet. Sprinkle with sea salt flakes while the chocolate is still shiny. Allow energy balls to chill in the freezer for 30 minutes until chocolate has set, then serve. 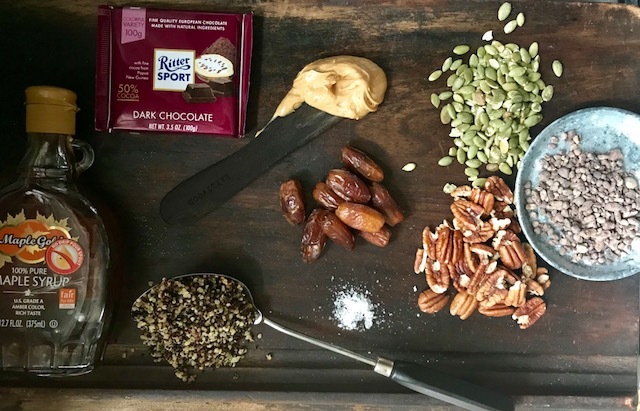 NOTE: substitute your favorite seeds or nuts, use honey or agave instead of maple syrup, almond or another nut butter instead of peanut butter, cocoa powder if you can't find cacao nibs. It's a very forgiving recipe!